One of the patterns in nature that is quite visible in everyday food, the chicken egg, and other places in nature and symbology is the egg. In the pictures above, you can see an erosion pattern that shows the hollowing out that seemed to be aided by the Maori people in the past in New Zealand. Eggs are tied to growth and as this growth of erosion was occurring, forces of nature led it deeper into shape in 3-Dimensions. When growth is needed, Nature utilizes this shape for efficiency and storage of information. Also in the slide above you see a picture from the Moa bird, a ground bird of New Zealand that has gone extent. Extinction itself is an expression of the rhythm of the universe that was highlighted in the opening page of this chapter. 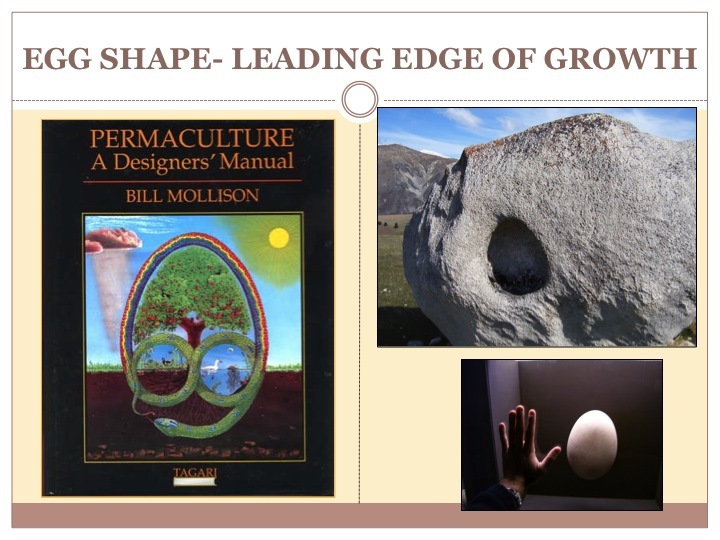 Even Bill Mollison choose to use the egg shape on the cover of his revolutionary book Permaculture: A Designers Manual. It tells a story using the symbology of the Australian Aboriginals and the rainbow serpent and in this version it forms an egg with another pattern we look at in this chapter: the overbeck jet. 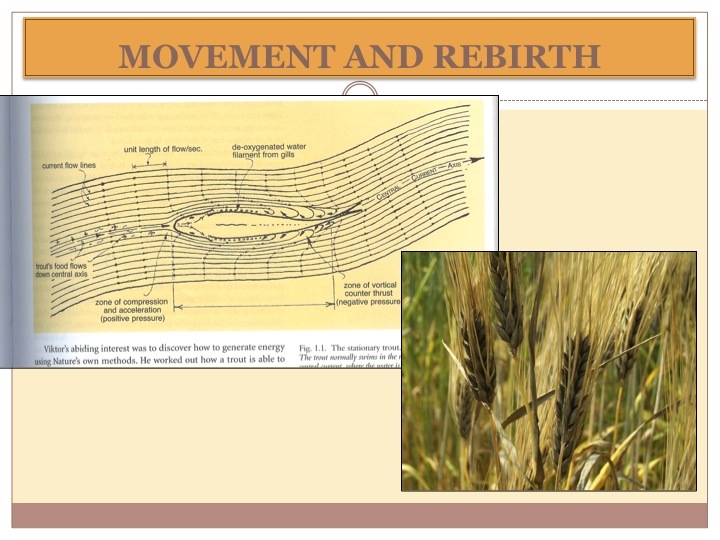 He tells a new story, a creation story if you may, with design allowing us to fuze the cyclical forces of photosynthesis, rain, sun, and soil formation. Combine that with earthworks and animal husbandry and you have the framework of this egg that is seeding a new culture; Permaculture. The egg also embodies movement and rebirth. Our civilizations in modern times are built around grains which are remarkable version of the egg and the efficiency of the shape. They are able to hold vast genetic information and also store enough carbohydrates to emerge from a static state into one of great dynamism. Strong enough to break through compacted soils, packed with organic chemistry to withstand insects and early germination, and nutritious enough to fuel civilization. It comes from this egg shape and the efficiency of its shape as its bursts into existence both above and below the ground surface where it germinates. Another form of that shape, elongated, is the shape of the trout which also represents how evolution formed efficiency. Inspired by the work of Victor Schauberger, the above graph from Callum Coats shows the shape of a trout and its interaction with water. Trout feed facing upstream in mountain torrents which theoretically should require vast amounts of energy expulsion to hold their position for their precise hunting. With this shape, water hits the front edge of the trout and like other objects in waters path, it causes it to spin back on itself. With correct proportions delineated by the golden ratio, the water hits the snout and spins inwardly with the flow. This squeezes the trout in feeding position and maintains its position in the stream with a mere flick of the tail. If you look at a trout from the side, from above, and from in front it is all egg shapes, all combining an incredibly energy-efficient fractal. the ancients reliance on this simple technology of terra cota and this motion inducing shape. Water quality is vastly important for our human health and we can learn from the past and once again create abundance from pattern application. 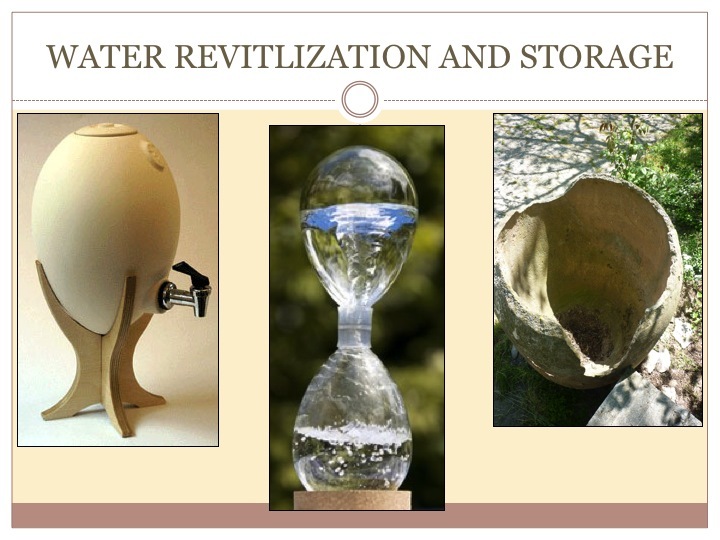 Storing water in these egg-shaped vessels is a great form of appropriate technology as patterns guide us in this work as they leverage the energy that each shape conducts.